Makro Productions today announced the release of Flight Map, a unique Android app that gives air travelers the ability to personally track their flights in real-time, just like the flight tracking programs offered by airlines on some long-distance flights. “The difference is that you are holding the tracker in your own hand, on your own device, and you can use it on any flight, whether the airline is offering its own flight tracker or not,” said Makro Productions President Marko Haulis. 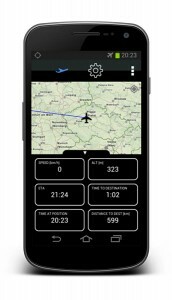 “This is great for those who love flight trackers but find themselves on flights that do not offer the feature. Because the application relies on a database of airports and flight paths downloaded onto one’s device, and the tracking is done via GPS satellites, Flight Map does not require an Internet or data connection to function. That means it can operate in the “Airplane Mode” common to modern smartphones, and not violate rules against mobile phone use during a flight. Multilanguage (currently English, Spanish, Portuguese, French, Russian, Chinese, Vietnamese, Czech).